Jio rivals are trying hard to sustain in competition & here is another good move by Airtel. Today, Airtel announced ‘value offer’ which is specially targeted for 4G handset users. Upon subscribing, users will get free benefits worth 9000 Rs till 31st December 2017. Offer is also valid for 3G customers but there will be limit on free data. Have you recently bought 4G phone? Or never used Airtel 4G in your existing phone? Then here is great opportunity to claim free data for whole 1 year. Let us take a quick look at offer terms & conditions. There are 2 main conditions : handset that you are using is 4G enabled & it was not previously on Airtel network for period of 30 days or more. Then choose your circle & select the myInfinity plan. 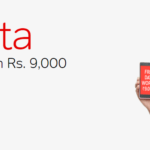 You have to activate value offer through ‘my airtel’ app only for the first time. After activation, free data for next periods will be auto credited to your account. We recommend you to read the terms & conditions given on the offer page thoroughly. Along with free data, you are also entitled for free incoming & outgoing calls. However, in roaming you will be charged for outgoing calls.